Elegant Conservation: the World is Your Home; Keep It Tidy! This peach tree has a rather deep well around its trunk, and outside this frequently-watered cavity, a ground cover of egg-sized stones helps it to conserve water. Cactus flowers are rare. Nobody knows how to induce these blossoms to open, and it is a mystery as to what conditions they prefer. 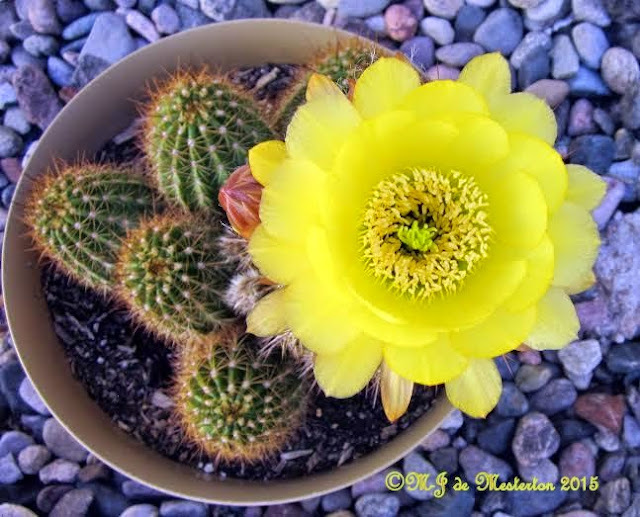 Some cactus buds never open, but dry up eventually and need to be plucked. These cactus flowers bloomed on April 28th, 2015. I consider it a miracle! The Wonder of Water--Don't Squander It! We seldom use a washer or dryer. That's by choice. I have plenty of water, two sinks and two buckets. When I say "plenty", I mean it is available, but I don't waste it. 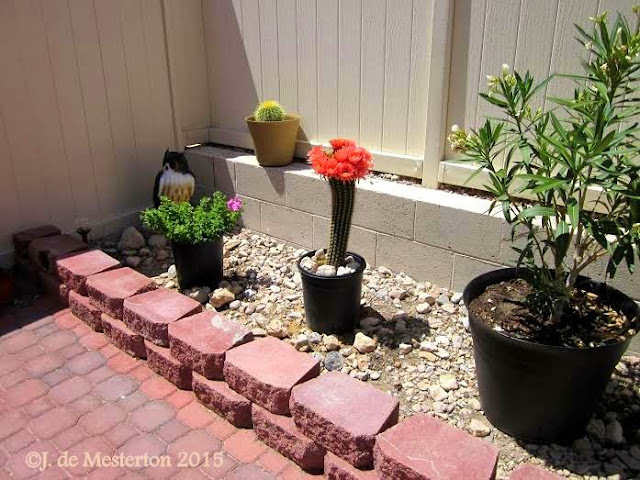 The beauty of washing and rinsing in buckets is that one can dump the "grey water" out in the garden. Plants don't mind soap or vinegar, in fact, vinegar and salt are safe fertilizers. I have the luxury of a wash-basin and a rinse-bucket. Note that the silver one matches the sink, while a white basin would look swell in a porcelain one. Sometimes I use a combination of the above additives, depending upon the stain. Alas, the 20 Mule Team Borax company has changed its old-fashioned box since I took this photo. Shavings of Zote soap produce many washes’ worth of environmentally-friendly detergent. The price of water is going up, and its availability in some locations is scarce. There are some things you can do to keep whatever water you do have from going down the drain in vain. Bathing usually uses less water than showering. Whether you bathe or shower, keeping the drain plugged will allow you to use this “grey water” later for other purposes. Use the bath water to give your outdoor plants a drink. They especially like Epsom salts, a time-honored fertilizer in England. Use a large, gallon-sized pitcher of bath water to flush your toilet. Pouring it down fast creates a flush; sometimes you will want to do this twice. A tubful of water can constitute twenty or more flushes. It works great. While running water to get it hot, fill pitchers, glasses, any empty vessels you have handy until the water gets hot enough to use, saving the cooler water for drinking later. When you bathe instead of shower, you usually use less water. To further enhance your water-saving program, carry the used bath-water outside in a large pail or pitcher to the garden. Plants don't mind a bit of soap, and they especially adore Epsom Salts, which are well-documented as an effective fertilizer. Water doesn’t grow on trees! In fact, there may come a time very soon when water is scarce. Look at the farmers in California who are not allowed to water their crops because of a tiny minnow that must be saved! I am more concerned about the future of the human race than I am about a useless minnow. In the event of a power-outage, or complete disaster, you will need certain non-electric kitchen tools. Let's say that you've successfully put away a stock of wheat. You will need to grind it for flour, or crush it for salads and pilafs. The traditional heavy metal meat and vegetable grinder, which attaches by vise to a table or counter-top, is necessary. If you have stored-up a load of coffee beans (whole coffee beans, like wheat "berries", have a much longer shelf-life than their ground forms), you will need a high-quality, hand-operated coffee grinder. For an affordable and elegant drinks party, make all the canapés yourself and arrange on your prettiest plates and platters, spreading them around a central table. Place stacks of small plates and cocktail napkins conveniently among the offerings. The hostess (wife) can carry platters around to guests often during the party, ensuring the land-locked chatters an opportunity to eat. Wine and soft drinks are sufficient, if you'd like to keep the drink-dispensing simple (cocktails are potent and complicated to mix; the price of a DWI being exorbitant, one wants reasonably sober guests leaving one's domicile...). The husband is in-charge of filling and refilling drinks. Walking about the rooms with a wine bottle to give refills on the spot is a good idea. The wife can monitor the food table to keep it neat, as well as make the rounds talking and relieving guests of empties. This sort of drinks party provides people with enough nourishment to make dinner unnecessary. Some components of your savoury items can be prepared in the two days preceding the event. Offer a platter of brownies or cookies for those who prefer sweets. Clean-up is easy. A team effort of husband and wife is ideal, but, coordination being essential, any two people who work well in tandem will serve. Provide an average of four canapes in each category per-person. Not every guest will partake of every offering, so this scheme usually works well. In the case of leftover items like angels-on-horseback (bacon wrapped around a water chestnut) and broiled), they are excellent re-heated the next day. Coat your appetizer shells with unsalted butter on the inside before filling them (unsalted butter has less moisture in it.) Butter will act as an insulator against moisture, ensuring that the canapes will not become soft from their contents, and will also be edible the next day. When creating platforms for your canapes, save the extra bread trimmings in a freezer-bag, and use them later for breadcrumbs or in a Swedish meatball recipe. Purchase a server's uniform (black vest, black bow tie, white shirt, optional white gloves) in a size large, so that it may be worn by whomever you find to help, then washed, stored and re-used on the next occasion. Instead of having your friends throw their coats on a bed or sofa, empty your coat closets and chuck your own coats onto the bed instead. This way, your guests have the dignity of hanging their coats in an orderly fashion, and of locating them easily for a smooth exit. This is an elegant, kind way to make your company comfortable, and all it requires is a bit of elbow grease. Emptying your closet for a couple of days just might facilitate a welcome closet re-organization, which is a great mood-elevator. 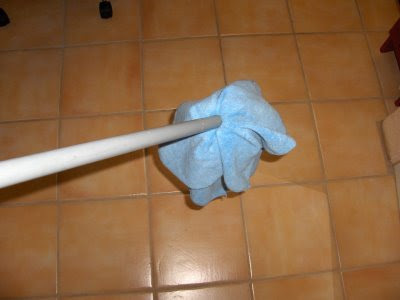 Update: I have found that a microfiber rag will adhere to a sponge-mop. Tie the ends and you will be ready to clean and polish a smooth floor with very little moisture. Fill a one-litre spray bottle with water, leaving room to add a third-cup of white vinegar and one teaspoon of lavender oil. Shake it. This is my preferred cleaning fluid. Mist the floor with it, and go over it with the dry microfibre mop until it is dry and shiny. This cleaning mist can be used on sinks and fixtures, mirrors, microwave ovens, jugs, anything that needs cleaning and shining about the house. It is also a deodorant. The scent of the lavender overpowers that of the vinegar. 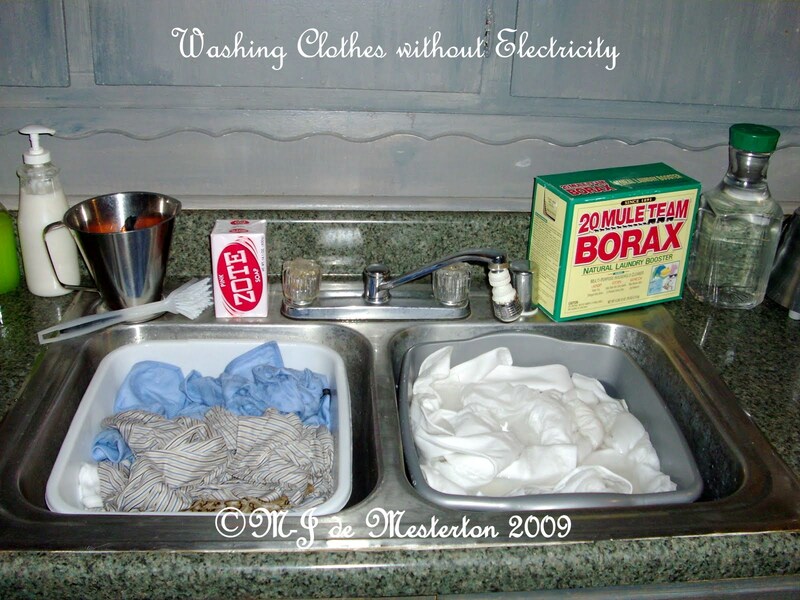 Careful--this method of cleaning is so easy that you may be cleaning as a hobby if you don't temper your enthusiasm! 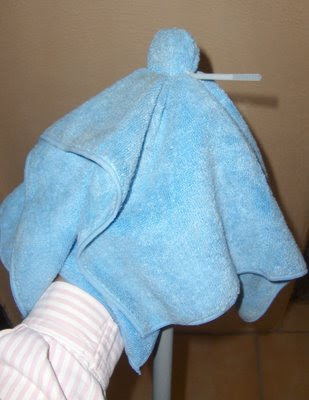 Omit the fabric-softener when washing and drying towels. It leaves a coating which reduces their absorbency. I prefer a sun-dried white cotton towel, which is excellent for an invigorating rub. Lightweight cotton towels for the kitchen and bath can all be washed in a solution of detergent and a little bleach. They dry much faster than coloured velour ones, and lend a look of sparkling cleanliness. Lightweight, white cotton towels may be bought in bulk at wholesale stores like Sam's Club in the U.S.
Use old-fashioned wooden clothespins to close bread and chip-bags. They’re cute, easier to manipulate than twist-ties, and cost less than chip-clips. Keep defunct candles in a plastic bag until you have enough to melt. A plain metal pot is best, and I recommend melting wax together from similarly colored candles. Shown are stubs from beeswax tapers and a yellow pillar candle. Old wicks and metal anchors for them are not a problem; just use a metal ladle to transfer hot wax, omitting the debris. Caution: don't melt used candles in a microwave oven--there will likely be a metal wick or anchor in it.